In the market for a new truck or Jeep, AND want to accessorize it? Don't want to pay the huge markups at the dealerships? Come to Outlaw Jeep and Truck Accessories and price out the accessories, lifts, tires, and wheels that you want. Take the quote to our preferred dealer to finance into the deal and save up to 50% off markups! Call or stop in today. 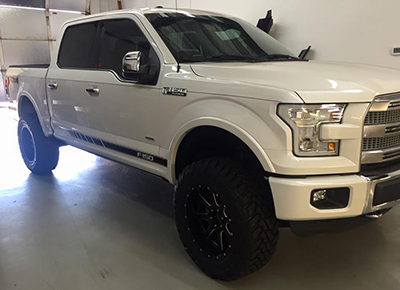 Outlaw Jeep and Truck Accessoriesf is Scottsdale’s premier Jeep and truck accessory store, offering a vast selection of high quality brand-name products for sale, as well as installation services. We provide the personalized service and care you should always be able to expect from a locally owned and operated small business. If you’re in need of Jeep accessories in Scottsdale, AZ, you’re in luck because, for area truck and Jeep owners, there’s no shop better suited to helping you discover, purchase and install high quality after-market parts and accessories than Outlaw Jeep and Truck Accessories. Owned by a motor vehicle enthusiast with over 20 years of experience in the industry, our shop offers the largest selection of parts and accessories in the area, and along with that huge selection comes the assurance of quality that you’ll only get from the very best manufacturers in the industry. We sell and install a large variety of brand-name Jeep and truck accessories. We are a locally owned and operated small business in Scottsdale, AZ. Our owner has more than 20 years of industry experience. We are committed to providing the highest quality products and services at competitive prices. We are authorized WeatherTech dealers. If you’re looking for after-market parts and accessories for your truck or Jeep, visit Outlaw Jeep and Truck Accessories today. "I love my Jeep so I will only let the best help me with it!! Outlaw is great, they are very honest about why they choose specific brands ove..."
"Great service . Professional work shop and clean. got my jeep in and done all in the same week gotta love that Highly recommended for anyb..."
"Such a great experience here! I took my Jeep in a week after purchasing it and Mike and the rest of the guys were extremely helpful in findi..."